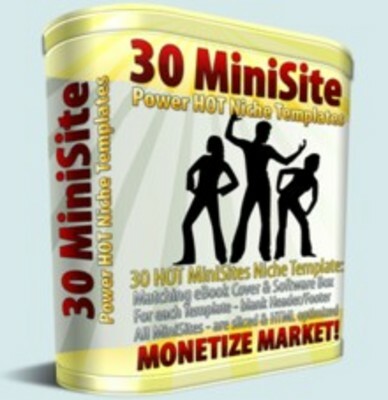 30 Hot New Minisite Templates with MRR. You may use this minisites for yourself or to resell the product. Well for one we want to help you as much as we can, but Alex and myself both have had some unfortunate events happen recently in our lives. My mother had a stroke and due to the fact she can not get medical insurance because of being on blood thinner most of her life, medical bills are stacking up left and right. Added to that, she can no longer work right now so other personal bills are also adding up, so I have taken on the obligation to help pay as many of those bills as I can for her. If you are like me, family does come first and is my main priority my parents have given me so much as I was growing up (Im now 24), so I want to be able to return the favor and help them for a change. So due to all the unexpected bills I have made an obligation to myself to help cover I need to earn some extra funds to do this withso I called on my good friend, Alex Albert my partner from https://www.tradebit.com, https://www.tradebit.com and https://www.tradebit.com. Alex's son which had to undergo some major surgery due to a problem with his throat, so Alex is also trying to earn some extra money to cover medical bills and the high cost of getting his son the best specialist money can buy. So, out of the need to provide quality medical care for our loved ones, and that's why we are bringing you this outstanding value today, if you act fast! charge $80.00 or more per mini site design?" Yes, I know this is shocking but it's true, and most times, it's some kid from a 3'rd World country, trying to hustle a fast buck. Trust me, these graphics, are brand new, professionally designed, and your satisfaction is guaranteed. Yes, this is the perfect solution for internet marketers, niche marketers, or anyone who has a product online, you can spice up your websites by using these professionally designed, and fully optimized Niche mini site templates. Now, we are just going to come straight to the point. We could have hired some fancy pants copywriter to fill you full of hot air, and hype, but we chose just to tell the truth, we are in a pinch, and we need your help. Now if you were to go out, and pay $80 a set, for these high quality graphics, you'd end up paying more than $2,400! That is way less than $1.00 each and if you order right now we will even include 5 additional niche mini site templates FREE OF CHARGE! That's right, we are going all out, on this offer, just for you.